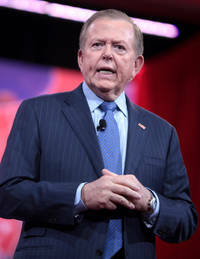 Louis Carl "Lou" Dobbs (born September 24, 1945) is an American television personality, author, radio host, and anchor of Lou Dobbs Tonight on Fox Business Network. He had previously anchored Lou Dobbs Tonight on CNN until November 2009, when he announced on the air that he would leave the network. Dobbs was born in Texas and lived there and in Idaho during his childhood. After graduating from Harvard University, he worked in government and banking before becoming a news reporter for several local media outlets. He had worked with CNN since its founding in 1980, serving as a reporter and vice president. He was the host and managing editor for CNN's Moneyline, which premiered in 1980 and was renamed Lou Dobbs Tonight in 2003. Dobbs resigned from CNN in 1999, rejoined in 2001, and resigned again in November 2009. In 2011, he resumed anchoring Lou Dobbs Tonight on Fox Business Network. He formerly hosted a syndicated USRN radio show, Lou Dobbs Radio and has written several books since 2001. This webpage uses material from the Wikipedia article "Lou_Dobbs" and is licensed under the GNU Free Documentation License. Reality TV World is not responsible for any errors or omissions the Wikipedia article may contain.